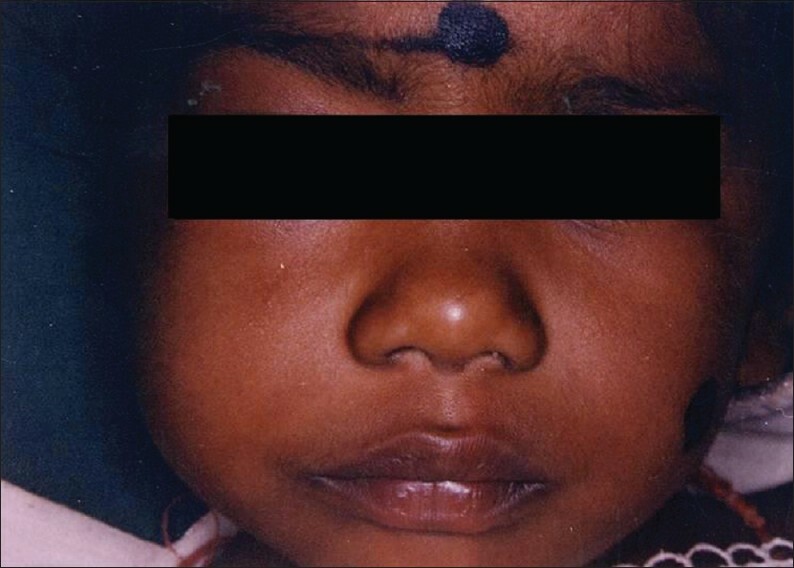 A female patient, aged 2½ years, presented to the V. S. Dental College and Hospital with a painless, slowly enlarging swelling on the right side of face, of 1 year duration. She had a family history of neurofibromatosis (father and uncle). Her past medical history was otherwise unremarkable. On general examination, the patient was moderately nourished and was in no apparent distress. Multiple " Café-au-lait" spots were seen in the trunk region [Figure 1]. No lymph node enlargement/skeletal abnormalities were present. On local examination, there was a gross facial asymmetry due to swelling on right side of face. Mild proptosis and periorbital edema were seen in the right eye region. Lisch nodules (pigmented hamartomas), appearing as dome-shaped elevations on the surface of iris, were observed upon slit-lamp examination. Extraorally, a solitary, diffuse, smooth-surfaced swelling was present on the right side of the face, which extended anterioposteriorly from cheek to temple area [Figure 2]. The swelling was nontender, nonfluctuant, hard in consistency, with no rise in surface temperature. 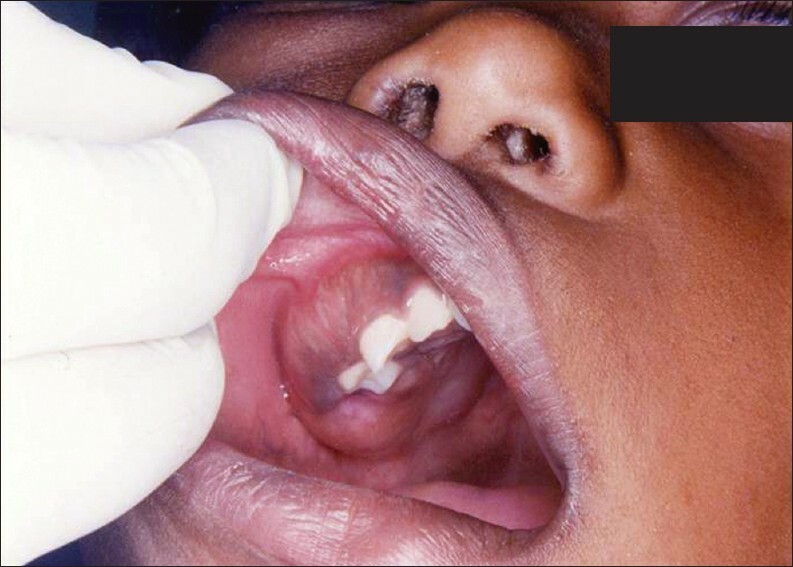 Intraorally, a solitary, well-defined ovoid swelling measuring 6 3 cm was present on the right side, extending from the distal aspect of upper right canine to alveolar ridge in relation to the unerupted upper right second molar, and from upper buccal sulcus up to 0.5 cm from the midline of palate [Figure 3]. On palpation, it was nontender, nonfluctuant, nonpulsatile and hard in consistency. Considering the patient's age and site of the swelling, a provisional diagnosis of neurofibroma was made. Orthopantomogram (OPG) revealed thinning of coronoid process, highly marked coronoid notch and hypoplastic condyle on the right side [Figure 4]. 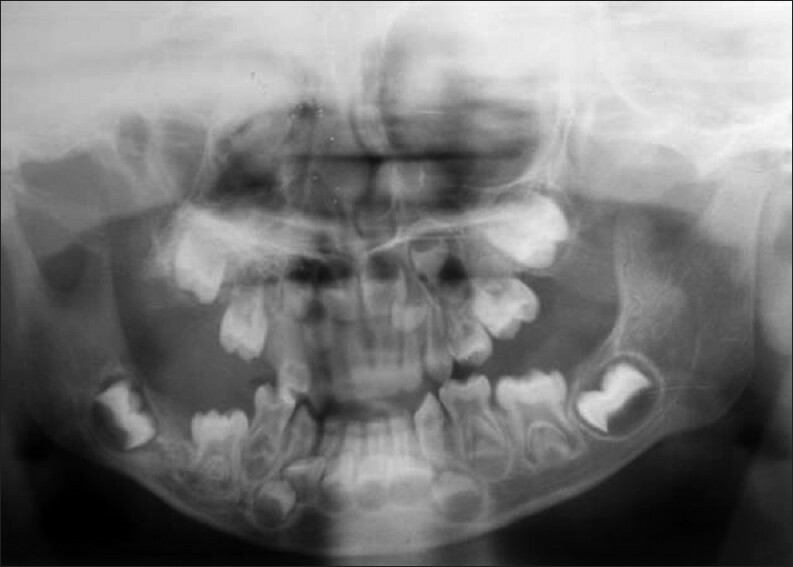 Paranasal sinuses view showed haziness of the right maxillary sinus. A contrast-enhanced computed tomography (CT) impression was that of a large plexiform neurofibroma within the right masticatory space, extending into right orbit, infratemporal and middle cranial fossa [Figure 5]. Routine blood investigations were within normal limits. Incisional biopsy was performed under local anesthesia. 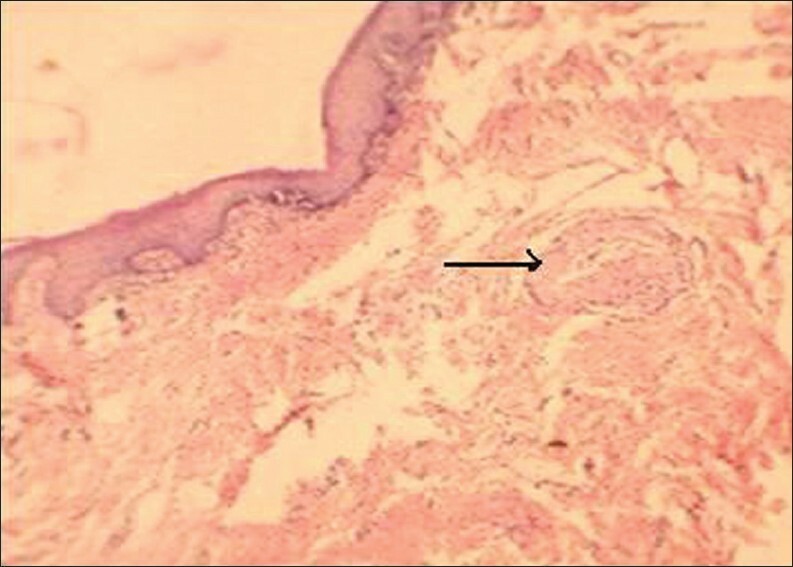 Biopsy revealed oral mucosa covered with stratified squamous epithelium and underlying dense connective tissue which was occupied by a lesion of neural origin [Figure 6]. The neural bundles were made up of spindle-shaped cells with wavy nuclei suspended in a delicate background of collagen fibers [Figure 7]. An immunohistochemical test for the S-100 protein was positive in 60% of the cells (detection system used was the HRP polymer), confirming the neural origin of the tumor [Figure 8]. The epithelial membrane antigen (EMA) showed faint positive staining for perineural cells in the nerve bundle. The histological diagnosis of plexiform neurofibroma was made, and correlating with the family history and clinical features, a final diagnosis of NF-I with pathognomonic plexiform neurofibroma was made. The patient was referred to NIMHANS for further management, considering the intracranial extension of the lesion. The word "plexus" refers to a combination of interlaced parts, or a network. They are elongated fibromas coursing along the nerves and frequently involving the trigeminal nerve or upper cervical nerves. Plexiform neurofibromas often appear within the first 2 years of life or before adolescence and occur in only 5% of NF-I cases. They can be quite disfiguring and hemifacial hypertrophy can occur secondary to a plexiform tumor involvement. [ 6] These tumors are known to cause symptoms ranging from minor discomfort to extreme pain,  and the consistency of the lesion has been compared to the "bag of worms" as soft areas are interspersed within the firm nodular areas which was not seen in our case. Radiologically, with very few cases reported, they usually appear as a unilocular, well-defined radiolucency. In our case, there were no radiological alterations related to the tumor in OPG, but there was thinning of coronoid process, highly marked coronoid notch and hypoplastic condyle on the right side. In CT scans, most neurofibromas show low attenuation, although some of them may show soft tissue density as was seen in our case. Histopathologically, the pattern may be that of distorted masses of myxomatous peripheral nerve tissue still within the peripheral sheath, seen scattered within a collagen rich matrix. This is considered to be virtually diagnostic of NF-I, even in the absence of other manifestations. S-100 is a useful marker for schwann cells, and the lesional cells are uniformly positive signifying that they originate from neural crest derived tissue. EMA-positive staining for perineural cells is always suggestive of plexiform neurofibroma. EMA was faintly positive in the perineural cells in our case, which confirmed our diagnosis. Plexiform neurofibroma is diagnostic of NF-I and its occurrence in maxillofacial area is unusual and few cases have been reported in the literature. We thus present this case due to its relative rarity. It is important that oral and maxillofacial surgeons and dentists keep this disease under consideration when oral lesions characteristic of NF-I are present. 1. Neville BW, Damm DD, Allen CM, Bouquot JE. Oral and Maxillofacial Pathology. 2 nd ed. Elsevier: Philadelphia; 2002. p. 457-61. 2. Geist JR, Gander DL, Stefanac SJ. Oral manifestations of neurofibromatosis type I and II. Oral Surg Oral Med Oral Pathol 1992;73:376-82. 3. Cawson RA, Binnie WH, Speight PM, Barrett AW, Wright JM. Lucas' Pathology of tumors of the oral tissues. 5 th ed. London: Churchill Livingstone; 1998. p. 280-1. 4. Cunha KS, Barboza EP, Dias EP, Oliveira FM. Neurofibromatosis type I with periodontal manifestation. A case report and literature review. Br Dent J 2004;196:457-60. 5. Harper JI. Genetics and genodermatoses. In: Champion RH, Burton JL, Burns DA, Breathnach SM, editors. Rook/Wilkinson/Ebling, Text book of Dermatology. 6 th ed. Oxford: Blackwell Science; 1998. p. 378-84. 6. D'Ambrosio J, Langlais R, Young R. Jaw and skull changes in neurofibromatosis. Oral Surg Oral Med Oral Pathol 1988;66:391-6. 7. Shafer, Hine, Levy. Shafer's Textbook of Oral pathology. 5 th ed. Elsevier: India; 2006. p. 282. 9. Pivnick EK, Riccardi VM. The Neurofibromatoses. In: Freedberg IM, Eisen AZ, Wolff K, Austen KF, Goldsmith LA, Kartz SI, Fitzpatrick TB, editors. Fitzpatrick's Dermatology in General Medicine. NewYork: Mcgraw Hill; 1999. p. 2152-8.